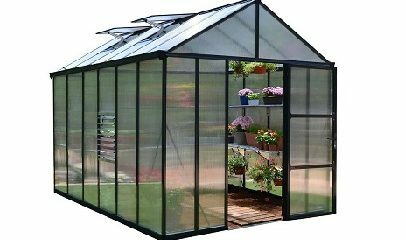 Our Glory Greenhouse offers the optimal environment for successful backyard gardening. The Glory is the ultimate greenhouse package. It has all of the great features you need. Wide entrance door, roof vent, automatic vent opener and side louver window create optimal ventilation and help you maintain correct moisture and temperature levels. The high roof allows for ample headroom, allotting you more space to garden and trellis tall and leafy plants.